There Are All Kinds of Different Standards to Consider In Sophisticated Valuations. Here are Some Tips. Control premiums are difficult to calculate. Why? Because there are so many variables. You may need to adjust earnings to reflect a control value (i.e., restating owner’s compensation and adjusting discretionary expenses). But wait: There’s more! There are minority earnings. And a variety of people to deal with: a business owner’s son, for instance, might have a quite different idea of what an appropriate premium should be compared to a differing idea from an investment banker who’s part of your team. Rand M. Curtiss offers some tips. Why there would be value above that based on control earnings. Why the investment banker believed a 25% premium was warranted, when the control premium implied by control versus minority earnings was 400%. This conundrum was very upsetting to me at the time, and shortly thereafter, I got hold of Dr. Pratt’s book and studied what he had to say about control premiums and how to develop them. That convinced me that the investment banker was wrong to add a 25% control premium on top of my ($100,000 earnings-based) value because it would double count the value of control. However, I was still troubled by the huge disparity between the 25% premium the investment banker asserted (consistent with public control premium data available at the time) and the 400% premium implied by my normalizing adjustments. Twenty years later, after hundreds of engagements, detailed study of our bountiful literature, and much thought, I can now reconcile that disparity, and more. This article takes a close look at control premiums, identifies the common problems we encounter with them, and suggests how to solve them. Enterprise value is the worth of 100% of the equity of a business. To keep things simple, only businesses with one class of equity—common stock—are considered here. A majority (a term defined by state statute, usually over 50%, but sometimes over 66 2/3%) owner is granted disproportionate legal power and thus the opportunity to economically benefit disproportionately if she prefers to do so. For example, she can, within broad limits imposed by state shareholder oppression statutes, increase her compensation at the expense of earnings (and dividends or appreciation) available to other shareholders. Her interest is thus worth more than its pro rata share of enterprise value. The amount by which its value increases is the control premium. By contrast, minority shareholder interests are worth less than their pro rata share of enterprise value, and that amount, equal in dollar magnitude to the control premium, is the discount for lack of control (DLOC). This is because minority shareholders are at risk of having their interest values decreased when the control owner exercises her salary increase prerogative, among others. Note that the sum of the values of the control and minority interest equals enterprise value: control is a zero-sum proposition (In this article, I ignore discounts for lack of marketability [DLOM] to focus on control premiums. All value references are thus to marketable levels.). We have recently divided the control premium into two parts: a financial premium (applicable to fair market value) for control of a business “as is,” and a strategic premium for synergistic (investment) value. Unless otherwise indicated, I discuss only financial control in this article. In my opinion, the way to distinguish between a “strategic” and “financial” control prerogative (a prerogative is a right that, if exercised, creates additional value for the control shareholder at the expense of the other owners) is to determine whether the prerogative, if exercised, would materially change the risk/return characteristics of the business. If so, it is strategic, if not, it is financial. 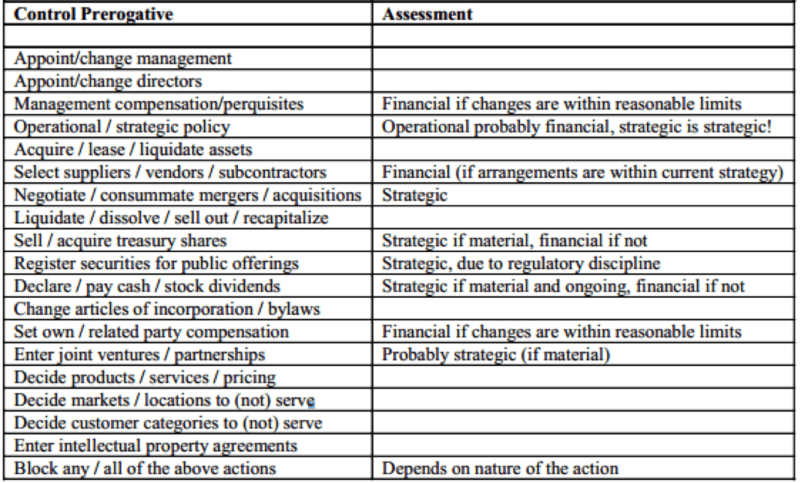 The following table lists the control prerogatives contained in the Fourth Edition of Pratt’s Valuing A Business (pages 365-366), the best list of which I am aware, and my comments as to whether each one is probably strategic, financial, or too case-specific to generalize (in which case no comment appears in the “Assessment” column). As with much in business valuation, there are always exceptions. CLICK IMAGE BELOW FOR ENHANCED VERSION. The control premium is 25% (this is true). The DLOC is 20% (the percentage reduction from 125% to 100%) (mathematically correct, but logically wrong, as described below). The minority interest is worth ($40 X 80% =) 32 (this math is correct). The mistake is signaled by the fact that implied enterprise value is ($75 + $32) = $107, greater than enterprise value. The error was to compute the minority interest discount as a percentage, when in fact, it is established in absolute dollar amount by applying the previously determined control premium. In this procedure, we estimate the control premium using Pratt/Mergerstat data, which compares merger and acquisition transaction prices (control values) to earlier stock prices (minority values) and infers the premium. I will have more to say about this below. 2. Bottom-up: determine the ratio of control to minority benefits as a percentage and deduct 100%. This is what I did with my retail store client to develop the 400% premium. Control benefits were $100,000, minority benefits were $20,000, the ratio was 500%, and the ratio less 100% was the 400% premium. My situation as described above: market data suggests top-down control premiums far less than those indicated by bottom-up control versus minority benefits analysis. Businesses with small or no control adjustments. Many businesses pay their owners fair market compensation and provide no perquisites or discretionary benefits. How do we account for the possibility of that changing? Minority shareholders certainly bear this risk. Valuing control of asset holding entities (like family limited partnerships) that are not operating entities because they generate no current income for their owners (because the assets are held for appreciation and/or their earnings are not distributed). Data limitations: many public mergers and acquisitions have strategic (investment value) rationales, which are not part of fair market (financial control) value; there are often no, few, or dated transactions in specific industries; public company valuation multiples are generally much higher than private company multiples; private company transaction databases report only control transactions which give us no handle on minority interest values. I will address each issue below, but, for now, consider them as indicating that something else is going on that needs our attention. 50-50 ownership situations: in the absence of side agreements, neither owner is in control, but each can block the other, so they are also not full minority owners. The absence of a control owner (e.g. three 33 1/3% owners or a 49%-2%-49% ownership): but in these cases, none of the interests are controlling, so we have no control premium problem. The “swing vote” issue is controversial. Voting versus non-voting stock: this has been well documented in our literature. I believe that these anomalies indicate that the value of control of private companies can be far greater than that of public companies, in relative percentage terms. A 400% private company financial control premium is not uncommon; it is virtually unheard of in the public markets. Private company control owners have far fewer limitations on their exercise of power than do public company owners (When public company managers try to usurp these powers, we get Enron.). Public companies are subject to boards of directors, auditors, creditors, the Securities and Exchange Commission (SEC), stock exchange, Wall Street, other regulatory authorities, oversight by large, sophisticated institutional investors, and the threat of hostile takeovers if they do not maximize reported earnings. Eric Nath’s hypothesis that public companies trade at control values (or else they would be taken over) implies that public financial control premiums should be very small. In fact, Dr. Pratt studied his database several years ago and found that, when he excluded all strategic (suspected synergistic) transactions and included transactions with negative control premiums, what we now call the financial control premium shrank to 10 to 15% from the previously reported 35%. In stark contrast, private company control owners are limited by far fewer authorities: the bank, if they are borrowers, shareholder oppression statutes (which are costly to contest and vague as to guidelines for oppression), and (not to understate this!) perhaps family harmony considerations. Because of this, and their natural motivation to minimize earnings and taxes, there is a large differential between control and minority benefits, and thus a very large control premium particularly when the minority benefits are close to zero. Since most private company control owners also manage them, they can pay themselves large bonuses and minimize corporate taxes. Because of these facts, I believe that the top-down application of relatively small public company control premiums to private companies will usually understate control value. I strongly prefer to complete a careful bottom-up analysis. A side point: if we are valuing a minority interest in a private company, why go through the circular exercise of adjusting benefits to control, and then applying a top-down minority discount? Based on the preceding comments, this may understate the discount and overstate minority value. In theory, these two processes should cancel each other out (Of course, we will normalize for extraordinary or non-recurring items.). If we value the interest based on minority benefits, we arrive directly at marketable minority value and then adjust for illiquidity. Save yourself unnecessary work and value the minority interest directly based on reported benefits! Although I cannot quantify these dimensions, they are very useful when thinking about specific control prerogatives and what they are worth. Let’s take my company—I am a sole practitioner—as an example. A financial buyer acquires it, but retains me to run it at my current compensation. In other words, they are a control owner, but effectively a passive or silent partner…at first. As such, they might be able to tweak a few things financially. I have to move to a cheaper office, wait another year to upgrade the office (not mine anymore!) computer, and so forth, none of these entailing significant risk, but saving money and increasing the owner’s profit. They certainly have the power to do these things, and it is highly probable that they will exercise those rights, but the economic benefits are small, and thus the value of control (over these prerogatives) is also very small. Indeed, they could go further, charging the company a management fee, reviewing my appraisals, and cutting my compensation, but there is a big risk: I would walk (Yes, I know there would be benefits, but no snide comments, please.)! Again, they have the power and there is a big economic benefit to be had, but the risk is so great that the probability of exercise is low and so is the value of these control prerogatives. If your assignment involves only the valuation of a minority interest, do not go through the circular exercise of adjusting benefits to control and discounting to minority value. When valuing a control interest, use the bottom-up technique whenever possible (i.e. whenever there are control benefits). This captures all case-specific factors, and you can use the legal power-economic benefit-probability of exercise model to explain very high implied premiums. The last factor, the probability of exercise, is helpful in justifying a control premium in situations where control and minority benefits are the same or very close. Do not rely on specific industry transactions; there may be none or very few and they may have elements of strategic control (investment value). Do use broad-based samples, perhaps of the entire database excluding strategic transactions and including transactions with negative premiums. You will probably come up with a control premium of from 5 to 15% before adjusting for case-specific factors. As a double-check, use broad-based (not industry- or asset-specific ones; it will not make a great deal of difference) closed-end fund discounts (and their implied control premiums). You will probably come up with control premiums of from 5 to 15% before adjusting for case-specific factors, confirming the Pratt/Mergerstat data. Closed-end funds invest in the securities of other companies, like mutual funds. The closed-end fund operator, however, does not redeem shares; they are publicly traded. Thus, there is a fixed or“closed” number of shares outstanding. Mutual funds are “open-end” because the mutual fund issues more and redeems shares. Closed-end funds trade at discounts because of the lack of control over investment choices (as well as other factors). Maybe in another twenty years, I will know more about control premiums, but there you have it, at least for now! Rand is President of Loveman-Curtiss, Inc. in Cleveland, OH, and is a member of the College of Fellows of The Institute of Business Appraisers, Inc. He can be reached by email at rand@curtiss.com, or by phone at (216)831-1795.